If you’re a Leo with your Sun in the 1st house, you’re life focus is very different from a Leo with her Sun in the 6th house. 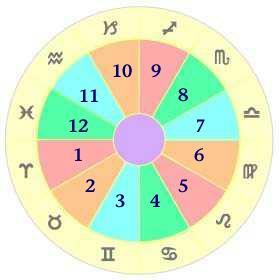 If you’re not already aware, an astrology chart is divided into 12 houses like a pie cut into 12 pieces. Each piece represents a specific area of life experience. The time of day you were born determines into which of the twelve houses your natal Sun will fall. Roughly speaking, if you were born at around 6 am, your Sun will fall in the 1st house, around midnight, it will fall in the 4th house, around 6 pm, the 7th house, and at noon in the 10th house. For those born sometime in between those times, your Sun will fall into one of the remaining eight houses. Each house is a field of experience determining in what area of life you will seek to define yourself. It is your life focus, the course you are majoring in. The Sun landing in the first house assertively states “I am me!” Your concern is impressing your will upon the world. You protect your freedom, independence, and strength because ultimately those qualities determine how forcefully you’ll be able to project your will. You want your impact to be felt. A first house Pisces Sun will impact the world forcefully with artistry and inspiration. A first house Aries will make her impact felt setting athletic records, taking courageous risks, and leading new ventures. A fourth house Sun says “I care for and am cared for!” They protect their home, family, emotions, and the past. Feeling close to family and those they love is their main focus. Developing nurturing tendencies and offering abundant nourishment for the body, mind, and soul is their life. An Aquarian with her Sun in the 4th house nurtures freedom, uniqueness, and humanitarian tendencies in those they love. A Sagittarian expands their definition of family to include those from foreign countries (exchange students) and nurtures from a large home with lots of physical space. Or maybe it’s their tolerant attitude that just makes everyone feel they have lots of space. A 7th house Sun says “I interact with others!” Their focus is balance and the give and take involved in relationships. Finding harmony in the perfect balance between being “a loner” and togetherness is a lifelong pursuit. They surround themselves with beauty in order to create balance. A Capricorn Sun in the 7th house takes relationships very seriously and usually takes responsibility for their success or failure. She works very hard at making her relationships succeed. A 7th house Gemini Sun finds harmony, balance, and successful relationship through communication and a variety of “togetherness” experiences. A 10th house Sun says “I work with what is possible in the world!” Their focus is their public life, career, and social status. They deal with rules, regulation, organization, and achievement issues. Often they take on leadership roles working within limitations to produce noteworthy accomplishments. An Aquarian 10th house Sun will achieve through unusual methods. They will break the rules creating new systems and rules of their own. A 10th house Taurus will build structures within limitations that provide for both security and sensuality. The other eight houses also define distinct areas of experience. To be able to understand the symbolic language of astrology, it is important to know house positions, especially your own.